Please welcome Christina (my wonderful sister) who shares insights on here every once in a while. She’s got good things to say and is most always better at saying it than I am. 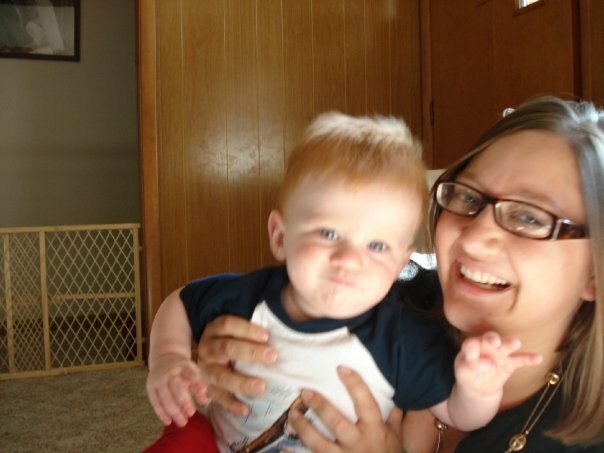 My current “profile” picture on facebook- with Roman at his 1st bday party! I love facebook. Well, I don’t know that I love it, but I sure do use it a fair amount. I got hooked when I moved to NY, and that was my one way of finding out what was going on in many of my college friends’ lives. Who was engaged, who moved to Africa, etc. It was so fun to have a window into lives of friends that I had grown apart from. As 1 ½ years have passed since moving back to Iowa and therefore could call up and hang out with many of those people, the purpose has changed a bit. I tend to use facebook more for stalking purposes. You know, you meet someone, see if they’re in your network, check out their pictures? No? Only me? I doubt that… :)Oh well! Anyway, recently I’ve been feeling not so great about this little relationship. Conversations I have over it are feeling less and less like conversations, and more like sentences shot out to feel a little better about not calling. And my biggest beef with facebook? My time on facebook seems only to make less content. This friend is recently engaged, this friend moved to a gorgeous island, this friend just purchased a house. Cue ugly green monster. I even found myself irritated the other day when I was looking at pictures of a wedding for a summer friend from 4 years ago- why wasn’t I invited? Not taking into account that I haven’t spoken to this friend for probably 2 years, and wouldn’t know her husband from the next guy on the street, and we definitely had not made any effort to keep in touch. Bad news, friends. I was indignant. So that’s that- my sin issues with facebook. Josh Harris, pastor at Sovereign Grace Ministries, and Author of some great books (including the popular “I kissed dating goodbye” from my high-school years,) wrote about facebook last summer, after he joined for one week. He found that facebook helped him waste time and took his focus off of Christ and put them more on himself… which led to him quitting after only 7 days. So what do I think about this whole deal? Well, I need to hold loosely my image on facebook. I need to remember that how people see me is not of much importance. I need to value real relationships and real conversations above internet “shout-outs.” I need to value finding out more about my God waaaay more than finding out about friends of mine. I need to praise God for blessings in others lives, and not let discontentment creep in. And if it does? Time to hit the off button, slather on some bug spray, grab some granola, and go head outside to go read some Bible. For, if you’re spending time thinking about God’s ability to “do more than we can ask or imagine,” it’s pretty hard to keep thinking about yourself. This entry was posted in Life Insight, posted by Christina.